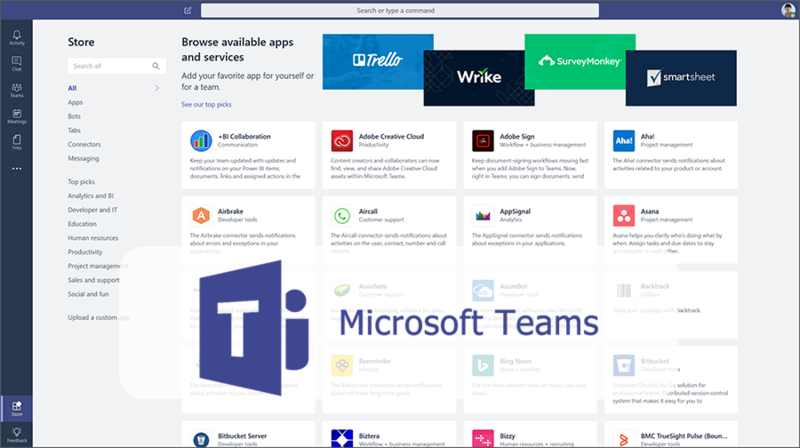 Microsoft Teams: Improving an already good Collaboration tool – CT Link Systems, Inc.
It’s been close to 10 months since Microsoft has introduced Teams in an effort to help their customers improve their collaboration within the work space. Through these months, Microsoft has been slowly improving Teams through their observations and user feedback. One example of this was the integration of third party applications such as Trello and SurveyMonkey. Even now they are still updating Teams, recently they have released a new update in which they have integrated exciting new features which will surely help your company’s collaboration efforts! Be able to discuss content from a different app directly in Teams with the latest update. Just like putting an emoji or GIF in the chat, you’ll be able to search and post integrated app information into chat and channels. Be able search for a specific task in Trello, a work item in Wrike, or even a weather forcast, and even integrate them it into an interactive card. With the update, you can now easily access apps you frequently use and even see all items on those apps such as tasks in planner, issues in Jira Cloud and even conveniently find items you recently used such notebooks from OneNote. This is made possible due to the addition of the personal apps space. In addition, you can also find a new app in this space called Who, a new app powered by Microsoft Graph, which enables you to search for people in your organization by name or topic. To make discovering and finding apps simpler in Teams by allowing users to search for apps by name, category, and integration type (like bots, tabs, connectors) in their new store. In the latest patch, Microsoft has added the function to query or command an app from the command box. You are now able to search information in an app and easily place the results into a chat or channel in Teams. More functions will be added overtime, one function they are working on is to create a task in your project management app over the Teams command box. A convenient new function added to Teams would be the addition of slash commands to help you execute shortcuts quickly. Contact us at 893-9515 to learn more about Microsoft Teams and how it can help you collaborate better with your own Team!